BrewNymph®: Hunahpu's Day® Is Saturday, March 11; Note the Spelling and Have a Checklist! 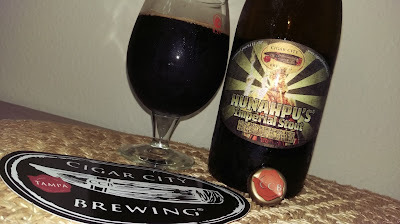 Cigar City Brewing (Tampa) has done just that, with its Hunahpu's® Imperial Stout. And, it's not just "another" beer, it's an annual event. The beer? In the words of Brewmaster Wayne Wambles: “Pours extremely dark in color with a brown head with notes of big chocolate and espresso, moderate notes of vanilla and cinnamon and a mild tinge of tobacco and chilis. The flavor opens with a big blast of chocolate and moderate espresso with elements of dark toffee and interjecting threads of vanilla with lingering hints of cinnamon and tobacco and chillies notes with a mild scoville heat in the finish.” The Imperial Stout clocks in around 11% ABV, with an IBU of 80 (so, yes, there's some substance here). Cigar City has earned a number of awards for the beer, and it consistently rates high in the Ratebeer, Beer Advocate and Untappd platforms. The brew is only released once a year. 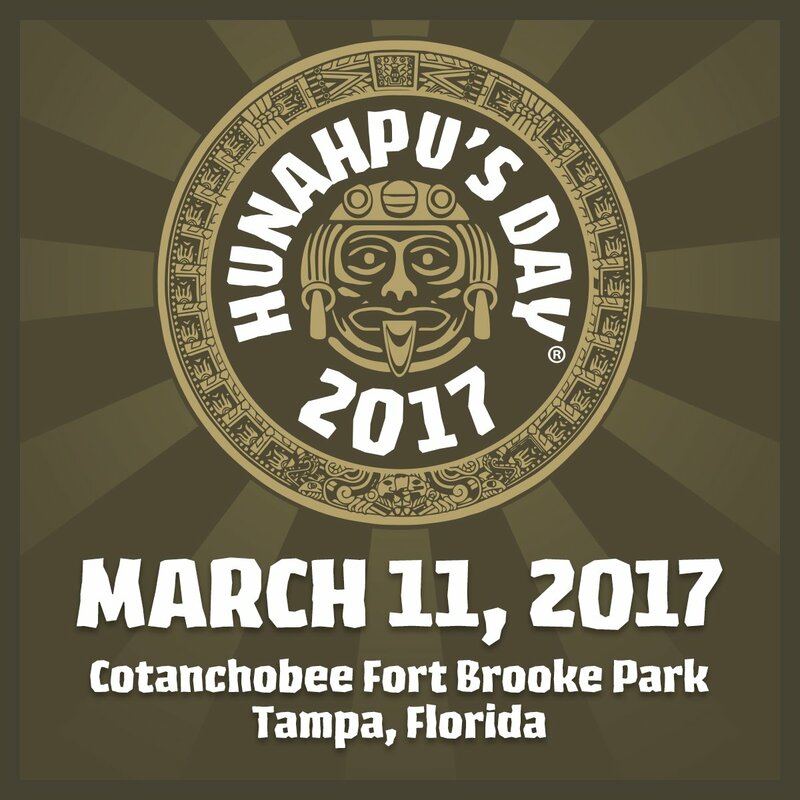 The 8th Annual Hunahpu's Day® takes place for the second year at Tampa's Cotanchobee Fort Brooke Park along the Riverwalk in downtown Tampa, on Saturday, March 11, from 11am-4pm. The fest celebrates the Imperial Stout and draws thousands of craft beer enthusiasts to Tampa (an estimated 4000, according to a CCB press release). 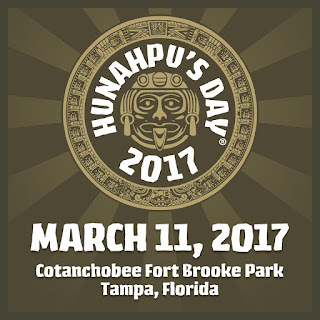 Like Hun Hunahpu, Hunahpu's Day itself has morphed from a "small group of friends and beer-lovers enjoying a unique Imperial Stout in a warehouse to one of the country’s premier craft beer events, with brewers and revelers traveling from across the globe" to Tampa, according to CCB. 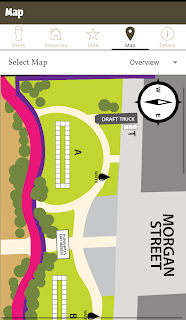 Originally held on the Cigar City Brewing grounds, the beerfest was moved to its current location last year. Everyone is probably familiar with the check-in and other issues that beset the fest a couple of years ago, and having learned from that, CCB regrouped with a well-run and professional event last year, by all accounts. This year, the fest features over 140 breweries from all over the globe, with hundreds of beers for attendees to sample. Proceeds benefit the Tampa Bay Brewers Guild. Admission to the beerfest is by advance ticket only, and, well, those are sold out. Entry to the fest is by individual RFID wristbands, which have been mailed out to attendees (IDs will be checked). 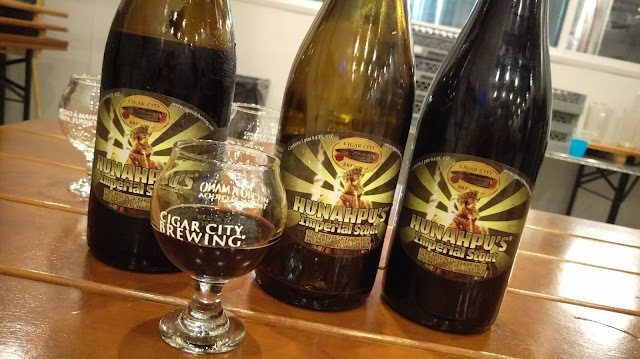 The ticket includes 4, 8, or 12 bottles of Hunahpu's Imperial Stout, depending on the ticket level purchased, which can be claimed at the adjacent Marriott Waterside Hotel (it's the only way to get bottles). In addition, entry includes four tickets for tapas-sized meals to be used over the course of the afternoon. The enormity of the event cannot be understated, and CCB has issued several pre-event emails to ticketholders, including a "Do's and Don'ts" video, together with detailed entry instructions. 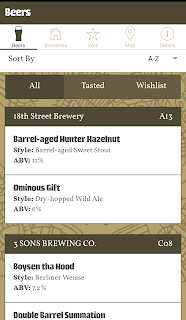 By the way, note the correct spelling of "Hunahpu's." It seems that the spelling confounds quite a few folks. Alright, this will be my first time attending Hunahpu's Day. 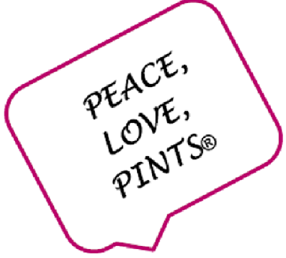 It's a "bucket-list" thing that every craft beer enthusiast should do at least once. I am aware of many who have made multiple journeys to Tampa over the years for the annual beer spectacle, but there's got to be a first time for everything! In some ways, this feels like my maiden voyage to Great American Beer Fest (GABF) in Denver a couple of years ago (there's a story for that, by the way). So, being a Hunahpu's Day virgin, let's see how I'm preparing for this monumental event. First, I am familiar with the entry procedures. Yes, it's rather detailed: entry to the admission gate begins at Thunder Alley at 9am; fest entry itself is at 11am; IDs and wristbands will be checked; no re-entry from the "holding area" (fest re-entry is allowed). No glass permitted on fest grounds. Register the wristbands via the website ahead of time. Once the wristband is on your body, don't remove it til you exit the fest grounds at the end of the day. Oh, what about transportation? Yes, again, downtown Tampa will be swirling with a number of unrelated events, so take an Uber, Lyft, cab, walk, or take the Trolley from Ybor. 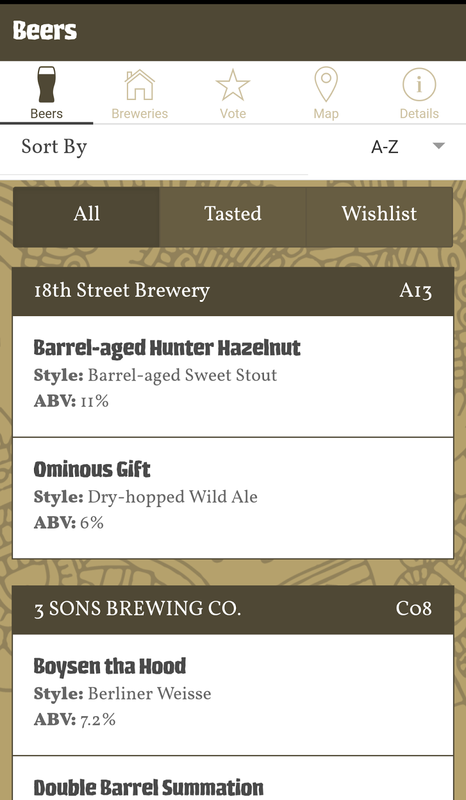 Attendees will even be able to vote for their choices for "Best Beer" and "Best Brewery" via the app. Photo from Cigar City Brewing Facebook Page. Preliminary beer list and map review? Check. I've attended many beerfests (as evidenced by the stories on this site). There are the usual considerations and "beerfest survival" essentials. Water. Yeah, that's a big one. It's important to stay hydrated, and although water is one of the four main ingredients in beer, consuming water throughout the course of the day at a beerfest is important to help balance the effects of the alcohol and keep your body in check. The fest allows, and in fact encourages, attendees to bring non-glass, refillable water containers, and water stations will be positioned along fest grounds. Sunscreen. It's Tampa; the forecast prescribes a sunny, mid-80° day; the Park is out in the open. Unless you want to turn a pretty shade of crimson, bring the sunscreen. Comfy shoes and socks. Needless to say, lots of walking. Those pesky white feet tanlines might be a vanity issue, but take care of your feet. Eats. The entry ticket includes four tapas tickets, but "cleansing the palate" in between the beers with crackers or pretzels will keep your taste buds fresh (pretzel necklace, anyone?). Not to mention that your body needs food to counter the effects of alcohol. Hat and Sunglasses. Again, Tampa sunshine. And, don't forget the camera (and the battery pack)! 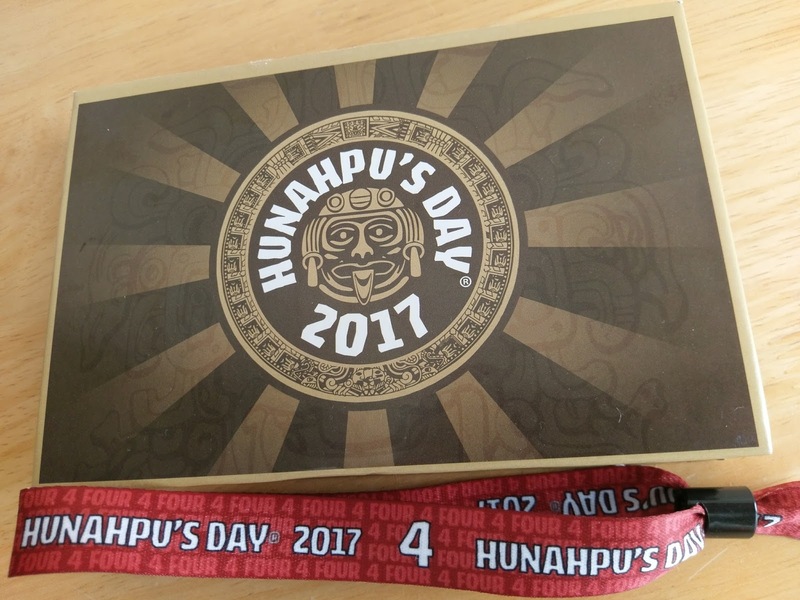 I'm looking forward to my inaugural Hunahpu's Day adventure! #HunaDay2017, here I come! And, I'm looking forward to heading back to Tampa! That's back-to-back Tampa weekends (see the recap story from FBG Fest last Saturday). By the way, you might (or might not) want to remember to turn your clocks ahead one hour Saturday night, as we head into Daylight Savings Time on Sunday. 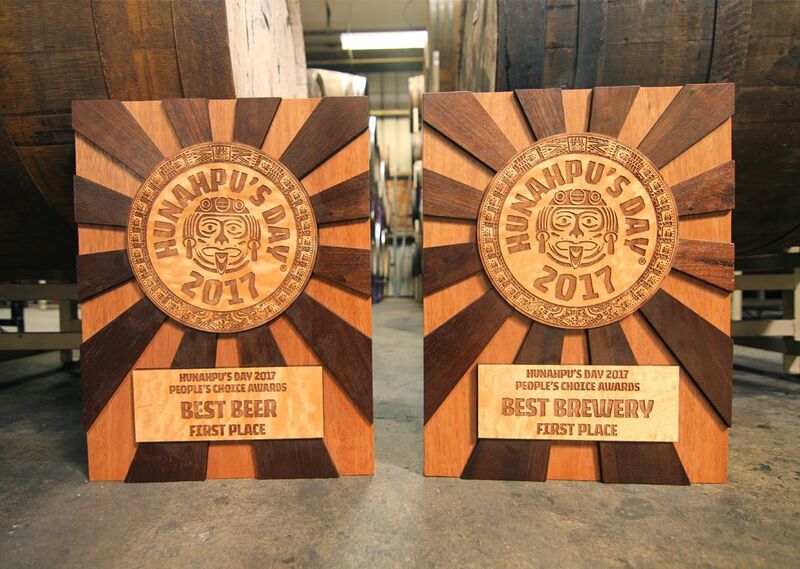 That might not be such welcome news for everyone waking up from Hunahpu's Day (unless you just stay up all night).